The Open Rugby League team wrapped up their season contesting the NSWCCC Cup Finals Day at the Kingsway Fields, Werrington on Wednesday 29 August. 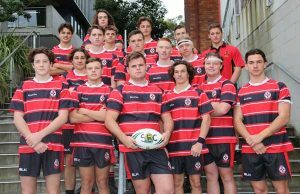 After defeating Loyolla Catholic High School at home in late Term 2, the team was drawn in the Cup Finals against the best Catholic teams across NSW. The competition is run under a player points allocation system that creates an even playing field for all. Winners of the two pools played off in the Final. Red Bend College Forbes was our first challenger. They got off to a flying start scoring twice in the early exchanges to lead 10-0 at the half-time change of ends. The boys held their nerve, as possession swung their way. Slick ball movement, going side to side created space for Nick Armstrong to score a couple and level the scores. This led to an entertaining last few minutes, as both teams played some enterprising football to try and steal the win. Unfortunately, time ran out with both teams sharing the points in a 10-10 draw. The disappointment continued as Aquinas College Menai failed to turn up for their game, meaning the pool had been reduced to 3 teams. Our second game against All Saints Maitland now became a must win game to advance to the Final. Knowing this, the team got off to a flying start, scoring early to lead 6-0. Confidence at a high and a glut of possession saw the boys take control of the game. Attacking the All Saints line, a stray pass lead to an All Saints player racing the length of the field to score. Declan Hall chased courageously, making a fantastic one-on-one tackle, rolling him onto his back. The referee made a contentious decision to allow the try and All Saints levelled the game. Early in the second half they scored again to lead 10-6 and it looked as though their Australian Schoolboys halfback was going to run out the game with his long kicking game. However, an always confident Eddies team had one last crack, with Sandon Smith scoring in the corner to level the scores 10-10. The result meant that we missed out, as All Saints went on to beat Red Bend in their next match. The result added to a ‘what could have been’ season for the boys. A special mention must go out to all the boys who turned up to play in the middle of their club finals commitments. Well done on another successful season.